Mix the lamb with the marinade ingredients. Cover and marinate for at least 2 hours, at room temperature. Put the butter and oil in a large, heavy-based pan over a medium heat. Add the lamb and marinade, and brown all over (do this in batches). Return all the lamb to the pan, add the tomatoes, honey, orange zest and juice and chilli. Cover and cook on a very low heat until the lamb is tender (1-2 hours), stirring regularly. Or, cook in the oven at 170°C/gas mark 3. Add the cinnamon and prunes. Cook for 10 minutes more. 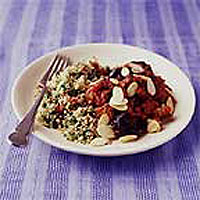 Serve sprinkled with almonds, with the couscous. To prepare this, cook as directed on the packet then add the mint and lemon juice (you can use 2 tbsp mint sauce instead), cucumber and tomatoes.